Does the java version support json too ? Not at this time, no. However that should be pretty easy to write. Can you give me a scenario you'd like it to cover? Well, by this blog I just realized it could be interesting to try use metawidget for our webservice tester in JBoss Tools - it supports wsdl and rest but it would mostly be for rest to allow editing and presenting the json response. What would be your preferred UI framework for this (SWT, JSF, GWT etc)? that would be for SWT since it would be in the eclipse tooling first....but the general comprehension of json into what fields and types it has we could use independently of any UI framework. i.e. to "scaffold" based on a rest/json service. Is it possible to transform the updated values back to json in the same format of the original one, in order to submit it to a server? Yes. Exactly that, in fact. If you wrap your line of code inside a save() function, and add a 'button onclick="save()"' tag to the page, that's all you need to do. when I have a json array inside my object, is there any way to add/remove items by metawidget gui? Manipulating arrays is fraught with personal choices about UI design. For example: is deletion done by a right-click menu? Or a delete icon on the end of each row? Or at the start of each row? Is addition done using a blank row at the end of the table, or as a footer row? Etc etc. Because of this, out-of-the-box Metawidget only goes so far. You should see it render the array as a table? This is done by metawidget.widgetbuilder.HtmlWidgetBuilder. For custom use cases, you can create your own WidgetBuilder and chain it together with the original ones using CompositeWidgetBuilder. Then your own WidgetBuilder can handle special cases (like arrays) and 'fall back' to the original WidgetBuilders for everything else. That code overrides '_myWidgetBuilder.addColumn' to wrap the column text with an anchor tag. So, just roughly, add something like the below to the code in this blog. It'll remove a row when you click on it. I think that my use case is a little bit more than that. I have a configuration that I would like to edit, that means sometimes add new sub-objects that weren't there before (and their structure can be realized from the schema). It's similar to how jenkins allows you to edit configuration but more complex (objects inside objects and arrays). So it feels to me that I might end up writing a framework inside that framework. What do you think? is metawidget should to be used that way? Yes, like I said, array manipulation is fraught with personal choices around particular UI use cases. Metawidget's basic answer is: WidgetBuilders. It sounds like in your case you may end up creating a little array widget to display/manipulate arrays. Or maybe just some HTML with some standard JS support functions. Either way, get that working first. Then you just need to write a WidgetBuilder to hook that in. The WidgetBuilder instantiates your widget as opposed to a table, or a select box, or whatever it would normally do. Thanks for all the effort. I think this array implementation is much more similar to what I think as a sensible widget ( I would have add an "add" ability somehow at the bottom). I think that since other widgets has property of "readonly" it might be sensible to do something similar to arrays. However, as I mentioned before my biggest concern regarding my use case is about items that appears in schema but are null (do not appear) in json object itself. is there any way to add the widget a possibility to add such objects? When you say 'items that appears in schema but are null' do you mean 'properties that appears in schema but are null'? So essentially a blank column in the table? ...includes exactly this. There is a property 'Employer' that is defined in the schema, but null in the JSON object. MetaWidget looks really impressive. 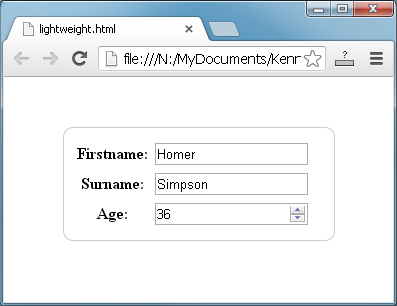 We are using JSONSchema to express our forms, but I couldn't find much about it in the documentation. Have I missed something? And the angular-addressbook and jqueryui-addressbook applications included in the examples download. If there is something else you need, I can add more documentation? Thanks for the help! The example is good! Could you tell me which JSON-Schema version does metawidget work great with? The main difference to version 4 is that 'required' goes on the property itself (whereas in version 4 they moved 'required' outside to a separate use case, for reasons I don't fully understand). Thanks for the quick response, is that the only difference that affects the use of MetaWidget? Or are there more differences? That's the only difference I'm aware of. If you find others please let me know! Great software you have build here. 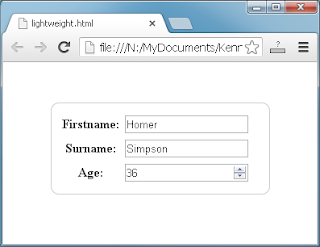 I want to use the metawidget forms rendering in html via pure json. So far i have managed to render the forms with sections for the fields but i also would like to create more than one column for the form and place the sections with the fields on the left and on the right columns of the form. ,but this will put the fields of the rendered object in the columns without respecting the section. Sounds great! If you need help with that, drop me a sample project to support@metawidget.org.